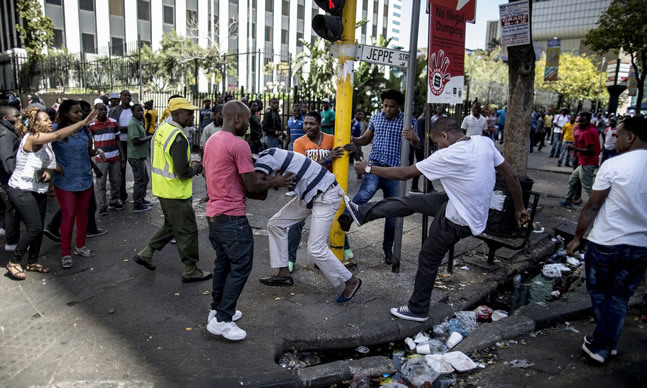 The Nigerian Community in South Africa said on Friday that a member was stabbed during xenophobic attack in Rustenberg, North-West Province area. 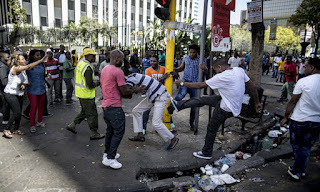 The President of Nigerian Union, South Africa, Mr. Adetola Olubajo, told the News Agency of Nigeria on telephone that the victim, identified as Desmond, was attacked on February 14. “Desmond is a Nigerian hairpiece hawker in Rustenberg, North West Province of South Africa. “He was attacked on February 14 and sustained multiple injuries. He was rescued when he was about to be set ablaze after being doused with petrol,’’ Olubajo said. He said the Nigerian community in Rustenburg was currently living in fear as tension has heightened in the area. Olubajo said the union’s executive had visited the city on a fact finding tour and had already spoken to Nigerians in the area. “Nigerians and their families told us that the situation was very dangerous and that their lives were not safe. “They also alleged that some group of people were abducting Nigerians and requesting money to have them bailed. “A Nigerian who couldn’t pay was murdered last month. This same group also looted businesses of foreign nationals, Nigerians in particular,’’ the president said. Olubajo said the union could not continue to keep quiet on the “criminal and xenophobic act” meted to Nigerians in South Africa. He said there was need for the mission and government to intervene in the matter to avoid further loss of lives and properties of Nigerians. “There is need for the Nigerian government to engage with its counterpart in South Africa. It’s not correct that those who were attacked and killed were criminals. “Such statements are misinformation and misleading,’’ he said.